I haven't written an Ask the Nutritionist post in a awhile but thought of this title in the middle of the night and had to get writing. This post will be about purple produce and the nutritional benefits. Besides the typical fruits and vegetables that are purple, farmers are now coming out with heirloom varieties of produce that are purple such as potatoes, tomatoes, cauliflower, corn and carrots. Besides that they are a pretty color, they are also very nutritious. The pigment that makes this produce purple is called anthocyanin, a phytonutrient known to help prevent cancer and heart disease. Also, a new study has found that eating two purple potatoes a day can help lower your blood pressure as much as oatmeal can! Eggplant is another purple vegetable that is great. It contains manganese, copper, fiber, vitamin B1, and potassium. It is also contains chlorogenic acid which helps to have anti-cancer, anti-microbial, and antiviral properties. Some other great purple produce to eat: purple cabbage, blackberries, and purple onions. 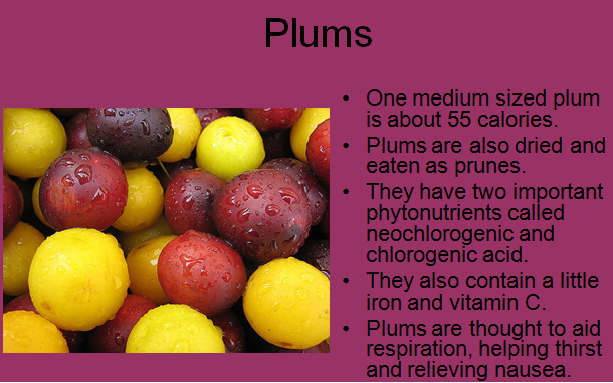 In summary, all produce is great but purple produce contains some wonderful vitamins and minerals that can help to prevent different diseases and conditions. Aim to eat at least one of these per day. 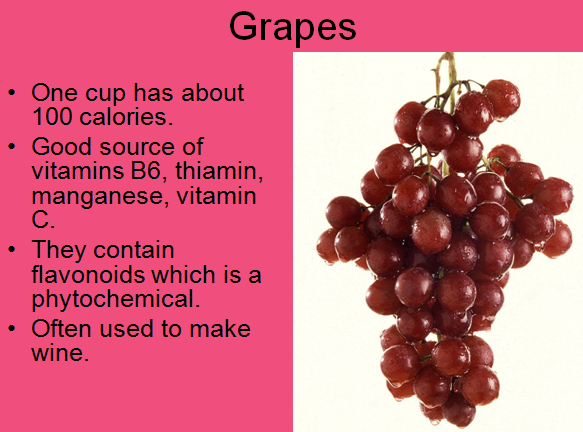 Please note: these pictures of the grapes and plums are PowerPoint slides that I made. Hi Amanda! Found you from the Monday blog hop! I am actually interested in interviewing you for a health article I am writing too! Let me know if you are up for it! Thanks so much for following and stopping by! Already following you!